Olive fruit consists of three important parts. Each olive contains about 70% juice out of which 40 to 60% is water and 10 – 30% is oil. Dry weight consists about 30%, which includes pit solids, seed, and skin and pulp solids. The first step in this process is to clean the olives and to remove debris, stems, leaves and twigs. Olives should be properly washed with water to remove the dirt and pesticides. Once the cleaning is done, the second step is to crush the olives into a paste. This is done with the help of large millstones. A 30-40 minutes ‘keeping time’ is required, that is, the olive paste is kept under the stones so that oil aroma and taste is produced by the fruit enzymes and to ensure that olives are well ground. The third step involves mixing the olive paste for 40-50 minutes so that the smaller oil droplets combine with the bigger ones. To increase the yield, water can be added or the paste can be heated during the mixing process, but this will lower the quality of oil. If this mixing process is carried out for a longer duration, the overall oil yield will increase, but the period of oxidation will also increase thus leading to a lower shelf life. The fourth step involves separating the oil from the rest of olive components. This step is done by centrifugation. The two-phase centrifuge technology separates the oil from the olive paste whereas a three-phase centrifuge technology separates the oil from water and the solids. After this process, the obtained oil is further processed to eliminate or remove any remaining solids or water. For this, the oil is left in the barrels for a final separation, which happens through gravity. The final step involves filtering the oil. Types of olive oil include. Extra virgin olive oil is the highest quality of olive oil. It is made by simply crushing the olives by mechanical extraction methods, that is, no chemicals or hot water is applied. The grade of olive oil can be determined by its acidity level. Lower level of acidity indicates the good quality of the olive oil. Extra virgin olive oil contains 0.8% free acidity, which is expressed as oleic acid of not more than 0.8 grams per 100 grams. In addition to this, extra virgin olive oil is produced under temperatures that will not lower or degrade the quality of oil, that is, less than 30°C, 86°F. Extra virgin olive oil is greenish golden to bright golden in color and has a fruity taste with a strong aroma. Virgin Olive Oil may have several varieties according to its acidity levels. Generally, its acidity content is about 1 to 3.3%. It also has natural flavors and aromas. Should I use Extra Virgin Olive Oil for Cooking? Extra-virgin olive oil’s flavor breaks down at higher temperatures used in cooking or frying. Therefore, it is not suitable for cooking purposes. Pure Olive Oil is best for cooking and frying purposes. As compared to extra virgin olive oil, the quality of pure olive oil is lower. The only difference between the two oils is that pure olive oil has free acidity level around 2%. Refined olive oil is obtained from virgin olive oil by refining methods. These refining methods do not lead to any alterations in the structure. Refined olive oil has 0.3% free acidity, which is expressed as oleic acid of not more than 0.3 grams per 100 grams. Charcoal, other chemicals and physical filters are used to refine this oil, but no solvents are used. Refined olive oil does not have the characteristic taste, flavor and aroma. It is considered inferior as compared to other varieties of olive oil. Olive Pomace Oil is inferior quality oil, which is extracted using solvents. Olive Pomace oil is a blend of olive Pomace oil and virgin olive oils. This oil is extracted from olive Pomace and contains aroma, taste and nutritive value to a lesser extent as compared to extra virgin olive oil. Therefore, it is blended with virgin olive oil to impart some benefits of olive oil. Which is Best Olive Oil? Olive Pomace Oil Cleaning Purposes (Furniture Polish), It is not good for eating, but sometimes, it is used for high heat cooking. Each type of oil has a different smoke point and this smoke point depends up on the quality of oil. The smoke point of an oil increases with the decrease in the fatty acid content and increase in the degree of refinement. This means lower the smoke point better is the quality of oil. 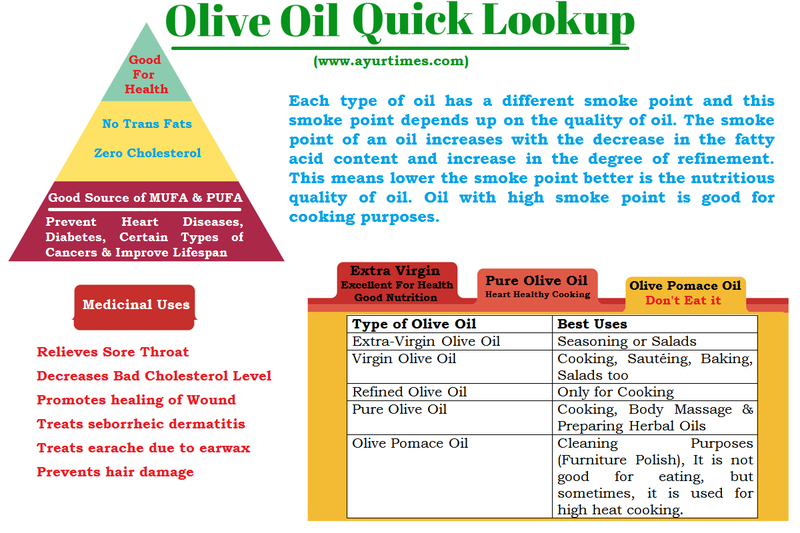 The smoke point for olive oil is roughly between 160-238°C. In addition to this, olive oil is also ideal for frying and is the most stable fat when heated. Olive oil if not over-heated does not undergo any structural changes. As compared to other cooking oils, the nutritional value of olive oil is better due to the high oleic acid content. Olive oil when used for frying does not penetrate and forms a crust on the surface of the food. This makes it a healthier option as compared to other cooking oils. Shelf life of olive oil depends on the olive variety, fruit ripeness, processing method and proper filtering processes. Here is a table for your reference. To prevent the rancidity and to preserve the delicate taste of olive oil, proper storage techniques are very important. Olive oil should always be stored away from light, heat and air. This can be done by storing it in a dark cupboard or it can be put in a dark glass bottle or stainless steel container. Olive oil is a good source of healthy fatty acid known as monounsaturated fatty acids (MUFA). When saturated fat and Trans Fats are replaced by MUFA in the diet, then the risk of cardiovascular diseases decreases. Olive oil improves the elasticity of arterial walls and prevents it from hardening. Besides this, olive oil plays an important role in preventing the formation of clots and platelet aggregation. Thus, in such a way it reduces the incidence of coronary heart disease. A healthy diet does not just focus on the quantity of oil used daily, but the quality of oil also matters. Olive oil is one such healthy oil that helps to lower LDL cholesterol (bad cholesterol), triglycerides and total cholesterol levels. A normal or healthy lipid profile further reduces the risk of onset of coronary heart disease. Being obese or overweight increases the risk of various diseases and disorders such as type 2 diabetes mellitus. Obesity increases insulin resistance and interferes with uptake of glucose by the cells and muscles. This glucose remains in the blood thus giving rise to hyperglycemia or high plasma glucose levels. Olive oil is one such healthy fat that prevents weight gain and may promote weight loss. Olive oil rich diet delays the onset of diabetes by preventing insulin resistance. As insulin resistance decreases, insulin sensitivity improves and peripheral uptake of glucose improves. Thus, a diet rich in olive oil, low in saturated fats, and rich in dietary fiber with moderate amount of protein enhances insulin sensitivity and helps to maintain plasma glucose levels within normal range. An increase in the oxidative stress may lead to the onset of various diseases and disorders such as type 2 diabetes mellitus, cardiovascular diseases, cancer, arthritis, Alzheimer’s disease and cataract. Olive oil is a great source of antioxidants especially vitamin E that fights oxidative stress and protects the body. These antioxidants scavenge the free radicals and keep diseases, disorders and infections at bay. Recent research has shown that phenols present in olive oil prevent the loss of bone mass. Olive oil increases the activity of alkaline phosphatase (ALP) and deposits calcium ions in the extracellular matrix, thus improving calcification. Thus, an olive oil based diet improves bone mineral density and prevents the onset of osteoporosis. Olive oil is very rich in antioxidants, which has shown to slow down the natural process of aging of human body. Besides adding it to your daily diet, applying olive oil on a regular basis can do wonders for the skin. A diet rich in olive oil prevents the growth of carcinogens in the body and thus provides protection against cancer. This is true especially for bowel cancer and breast cancer. Research has shown that a diet rich in olive oil can treat indigestion and abdominal discomfort. Olive oil is also known as a super brain food as it has shown to improve memory and it prevents memory loss and mental agility especially in older adults. In addition to this, it has also shown to improve cognitive function and intellectual ability. Applying olive oil on incisions after surgery helps in faster recovery and leaves no scars behind. A small teaspoon of olive oil can soothe a sore throat and prevent coughing. Seborrheic dermatitis is a very common condition in children where skin cells build up together and this may look like a white scaly cap on top of the head. Applying olive oil on the scalp and gently massaging it helps the skin cells to soften and helps in the treatment of seborrheic dermatitis. Prolonged exposure to the sun may increase the risk of getting skin tumor and skin cancer. One can simply apply olive oil on the skin that was exposed to the sun and leave it overnight. Wash your skin next morning. Olive oil is a very rich source of antioxidants, which fights cancer and oxidative stress by neutralizing the free radicals and carcinogens. Earache is a serious problem, which can occur at any age. Wax buildup in the ears can lead to pain and hearing problems too. Adding a few olive oil drops to the ear canal may help to remove the wax buildup. Applying olive oil on the scalp and hair shafts can moisturize your hair and can help to treat damaged and dry hair. This is possible because olive oil is a great source of vitamin E and other antioxidants that improves the quality of hair, strengthens it and adds shine to your hair. Replace butter and other oils with olive oil for baking, sautéing and stir-frying. Use olive oil for grilling, baking and frying. Add olive oil to gravies and soups. The recommended daily intake of olive oil is one and half to two tablespoons. Research has also shown that as per Mediterranean diet six tablespoons olive oil can be consumed daily in combination with nuts, whole grains, fruits and vegetables, beans and seafood. However, a person who is on a calorie restricted diet or weight loss should not consume more than one and half tablespoons of olive oil per day.